We work hard to come up with one of a kind gifts﻿, while promising the best prices, quality and customer service! We'll personalize your gift for ANY industry, or find something in our huge selection: construction, contractors, painters, architects, realtors, medical industry, trucking and transportation, electricians, firefighters, accounting and finance, and lawyers. Sold exclusively at The Gift Planner. Unique one of a kind tool box that is perfect for any industry. The Chocolate Tools Gourmet Treat Job Box Extravaganza measures 8.75" x 4.5" x 4.5". Custom colors available for orders of 200 or more. Contents include pretzel bundle (6 pretzels), mini oreo box (18 cookies), chocolate graham cookie bag (6 cookies), chocolate rocks, hard hat and shovel trio, 8" foiled chocolate saw, 6" foiled chocolate wrench, chocolate hammer, 3 ounces of nuts and bolts (2 bolts and 3 nuts), 2 additional 3" assorted milk chocolate themed tools, 1 box of cinnamon toast pretzels, 6 hand painted tool sweet bites and a crsipy filled hard hat. Customize this gift in your corporate colors. 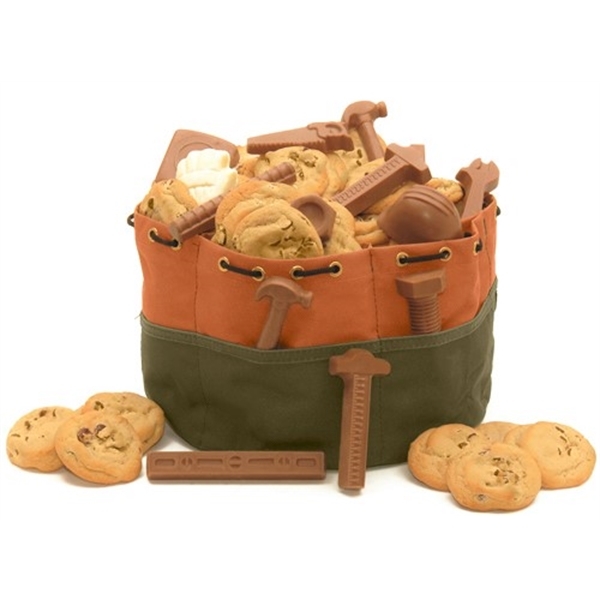 A canvas roll up tool bag with delicious chocolate tools of the trade. 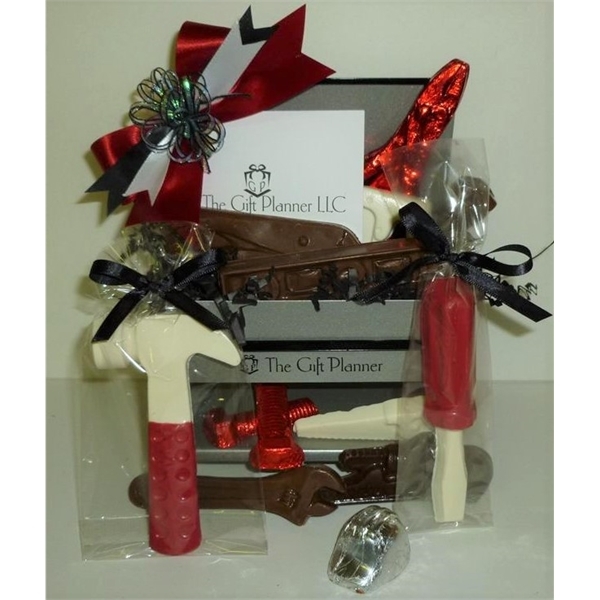 A great themed gift to represent any contractor, builder or handyman. Our delicious chocolate tools are available in milk, dark or white chocolate. Makes a great corporate holiday gift to represent your company. Corporate themed gift for Construction Companies and Contractors. Miniature work bench toolbox measuring 6 inches x 4 inches x 4.5 inches. Filled with delicious milk, dark and white chocolate tools and other delicious gourmet industry themed salty and sweet treats! Custom and creative tool bag filled with 18 soft and chewy cookies and 22 ounces of delicious milk, dark, and white chocolate tools of the trade. Chocolate tools to represent any industry! A canvas bungie tool bag that can be silk screened with 50 quantity. Hang tag option available with logo and gift message for any quantity. This one of a kind corporate business gift is great for contractors, builders and anyone who works in the construction industry. Great for corporate holiday gifts, thank you gifts, appreciation gifts or just because. Construction Zone Gourmet Metal Toolbox measures 16 inches x 7 inches x 5 inches. 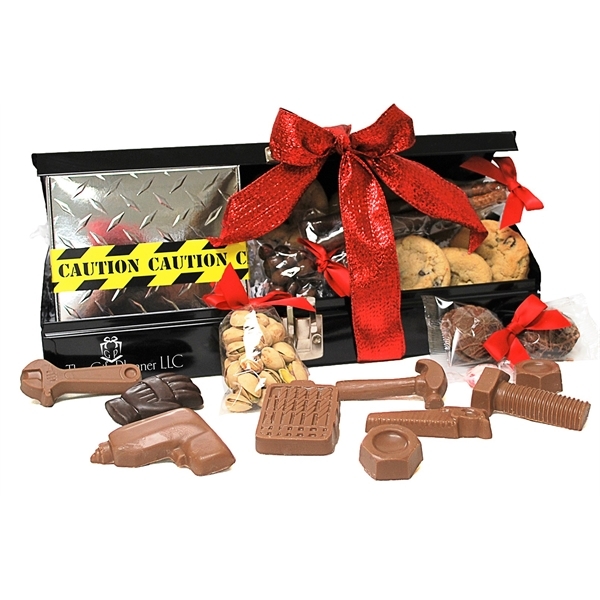 This black metal toolbox is a corporate gift basket filled with 12 soft and chewy chocolate chip cookies, 4 chocolate covered Oreos, 2 chocolate dipped pretzels, (9) 1 ounce milk chocolate construction themed tools, 3 ounce bag of pistachios, 3 ounce bag of chocolate covered peanuts, mints and 3 gift wrapped chocolate bites. Choose your corporate ribbon and bow color and imprint your logo on toolbox or hang tag. This ultimate desk organizer toolbag coffee mug makes the perfect Industry themed gift. 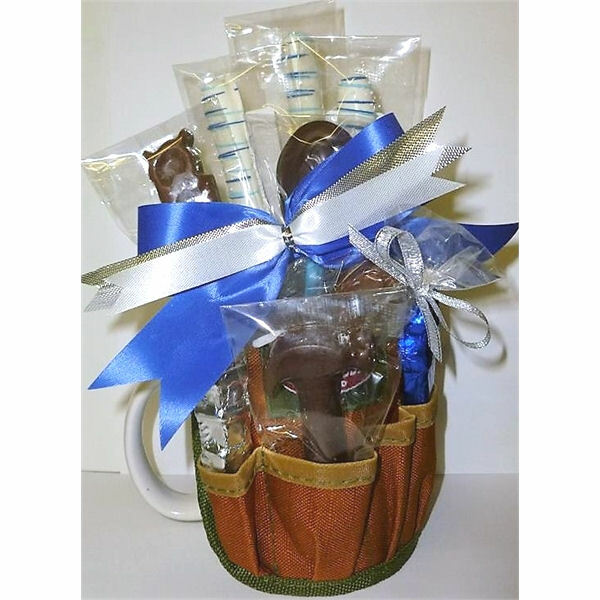 Delicious chocolate tools, chocolate spoon and pretzel rods fill the mug and pockets. Made for contractors, construction companies, builders and handymen. These adorable coffee mug gifts are great for corporate holiday gifts, client gifts or thank you gifts. Use your corporate colors on ribbon, bows and foil wrap. A hard hat gift basket fit for a king! Delightful gourmet cap style hard hat with 6-point ratchet suspension filled with Butter Toffee PeanNUTS and chocolate BOLTS, ELECTRIFYING Chocolate Graham Cookies with milk chocolate outlet and white chocolate lightbulb, GROUND BREAKING Cinnamon Toast Pretzels with chocolate rocks and milk chocolate shovel and many more fun snack items. This one of kind hard hat gift basket makes a great holiday gift, thank you gift or client gift. 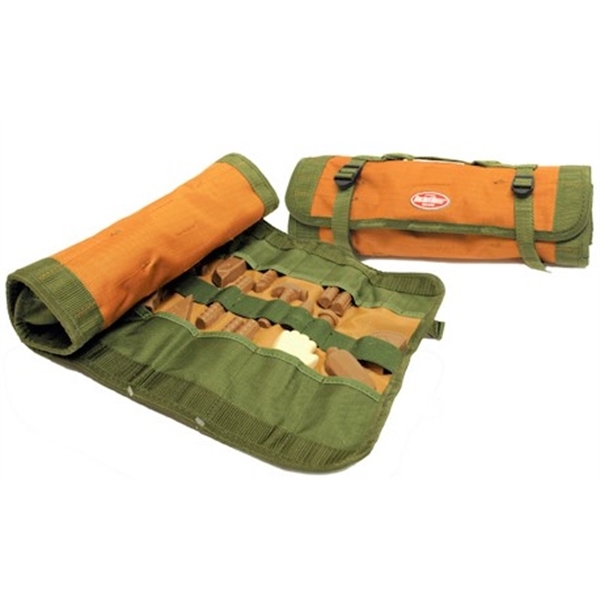 Includes 12 long stem chocolate tools of the trade inside a canvas bucket boss roll up tool bag. 9 pieces of delicious 2.75 oz. milk chocolate tools and 3 pieces of delicious 1 oz. milk chocolate pieces. Choose the themed pieces to represent you, your company and industry. Customize with a hang tag or silk screen your logo on the bag! Product names including Bucket Boss, Bucket Boss Original, Bucket Boss Professional and associated logos are trademarks of Pull'r Holding Company, LLC. Need something custom or personalized? Just ask. 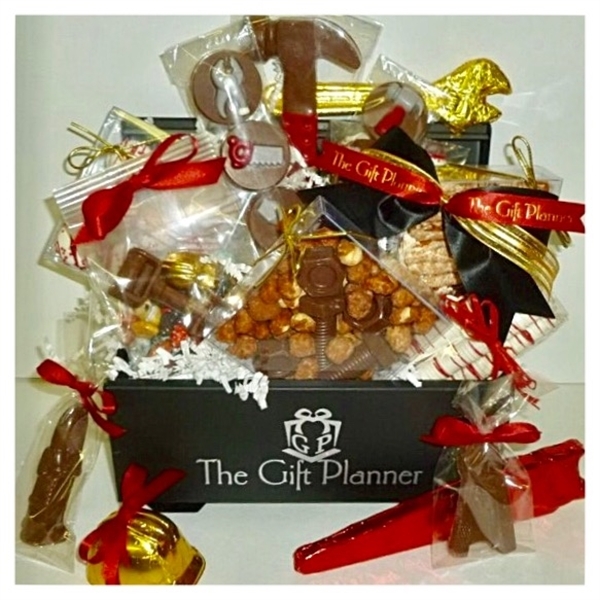 Shop More Gifts By The Gift Planner!